Computer registers are designated by capital letters (sometimes followed by numerals) to denote the function of the register. For example, the register that holds an address for the memory unit is usually called a memory address register and is designated by the name MAR. Other designations for registers are PC (for program counter), IR (for instruction register, and R 1 (for processor register). The individual flip-flops in an n-bit register are numbered in sequence from 0 through n - 1, starting from 0 in the rightmost position and increasing the numbers toward the left. Figure 4-1 shows the representation of registers in block diagram form. The most common way to represent a register is by a rectangular box with the name of the register inside, as in Fig. 4-1(a). The individual bits can be distinguished as in (b). 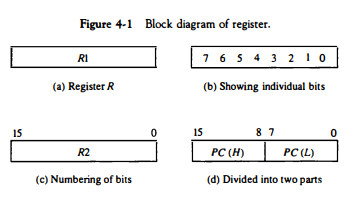 The numbering of bits in a 16-bit register can be marked on top of the box as shown in (c). A 16-bit register is partitioned into two parts in (d). Bits 0 through 7 are assigned the symbol L (for low byte) and bits 8 through 15 are assigned the symbol H (for high byte). The name of the 16-bit register is PC . The symbol PC(0-7) or PC(L) refers to the low-order byte and PC(S-15) or PC( H) to the high-order byte. denotes a transfer of the content of register R1 into register R2. It designates a replacement of the content of R2 by the content of Rl. By definition, the content of the source register R1 does not change after the transfer. A statement that specifies a register transfer implies that circuits are available from the outputs of the source register to the inputs of the destination register and that the destination register has a parallel load capability. Normally, we want the transfer to occur only under a predetermined control condition. This can be shown by means of an if-then statement.